The sets and parks are the same as for Season 1 and 2, where each set has 15 packs, and each pack has 5 collection cards and 1 bingo card. Breaking that down further, of the foil cards, on average, 3 will be the foil autograph cards, 4 the Gee foil cards. So you’ll be looking at getting at least 3 sets to get a full collection of the foil autograph cards. 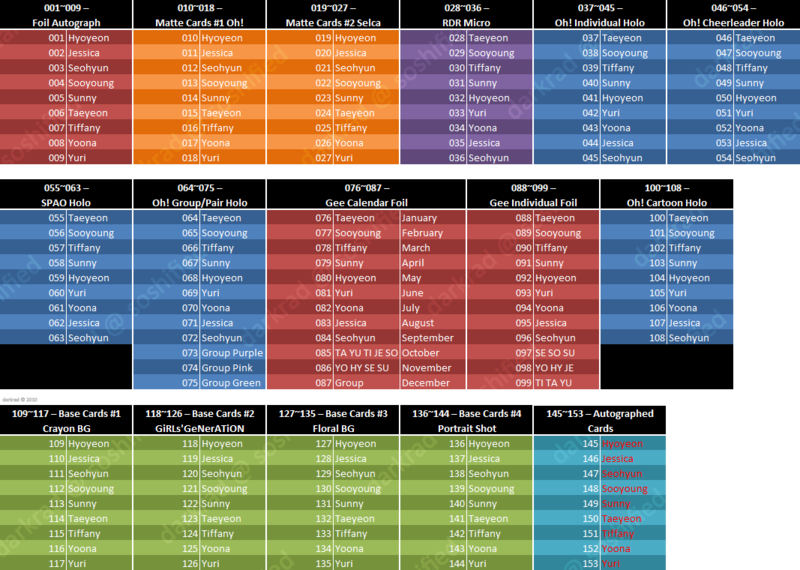 For the matte cards, you can expect roughly a 50/50 split in the number for each type (Oh! Lyrics bg and ‘Selca’) in a set and probably get a minimum of 6 sets to get the all 18 matte cards. 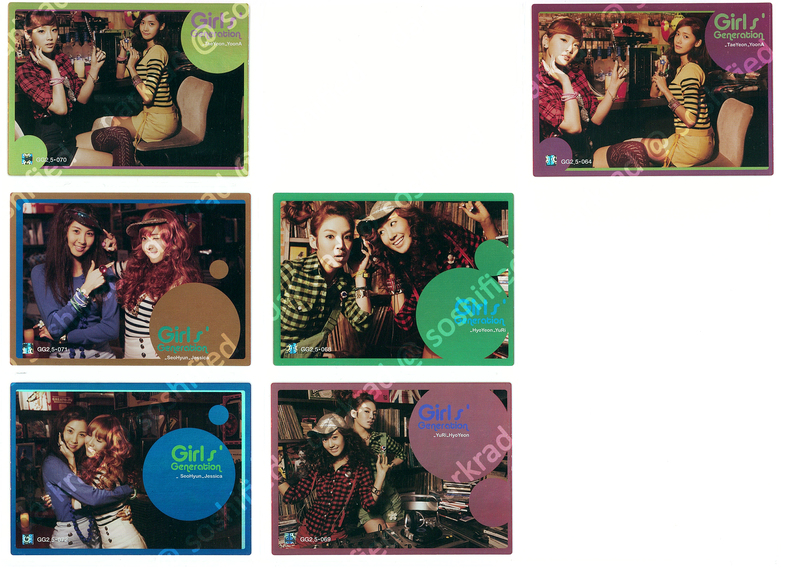 The foil cards are include the printed autographed cards (001-009) and the Gee calendar and Gee individual cards from Season 2. There aren’t any differences between the Gee cards, except that the colours in Season 2.5 seem a little paler as the card itself has less of a shine to it due to a matte finish. The micro cards are exactly the same as in Season 2. The holo cards are no different in the pictures used, merely instead of checks (037-087 & 100-108) and foils (064-075) they are holos. As for the matte cards, in terms of thickness, they don’t feel any different. The pictures of the girls appear to be slightly raised and have more of a glossy finish to them as opposed to the background which is what I’d consider to be matte (non glossy finish). And in comparing the three seasons so far, I still reckon that Season 1 has been the most satisfying, and that Season 2.5 is the true Season 2 especially with the base cards looking THAT much better. so since there’re only 36 variations of base cards and we will get 60 base cards in a set so it will be most likely to complete it by just buying 1 set only right?? I’m totally agree with you.. season 1 is the most satisfying and worth to pay for..
SM is cheap so I dont think they will be making another season like season 1 again..
even this one also they repeat like almost every rare cards from season 2.. This is a very nice guide. If you don’t mind, I’d like to quote and credit you on SSF for the Season 2.5 trading card thread. Not a problem =D Go ahead. Would you mind if I share this photo in SSFC the webboard in Thailand ? OMG what a nice guide ! The new concept cards are great ! Definitely better looking than season 2 . Thanks darkrad ! where are you from? which website forum did you see? 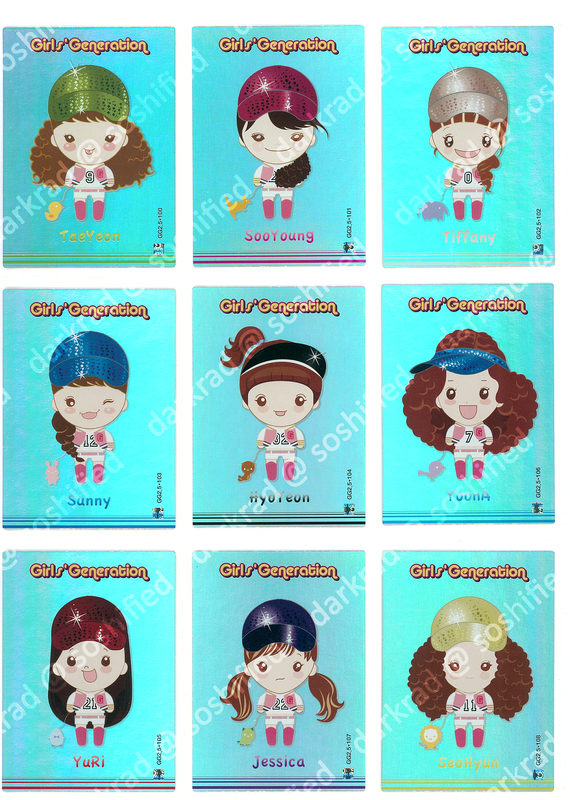 @neng: I saw the cards in many forums & websites – SSF, Pretty Taiwan, ebay, etc. I got a Hyoyeon signed card yesterday too so there are definitely several signed cards per girl. But I don’t think there are more than 10 per girl as I’ve seen too few of them on eBay. Usually, there are like 2-3 sellers that manage to get all the cards and sell them on eBay…this time, I’ve only seen like 3 or 4 of them ! Moreover, this is the first time there is only one kind of autographed cards so I guess they wanted to make them really hard to get ! 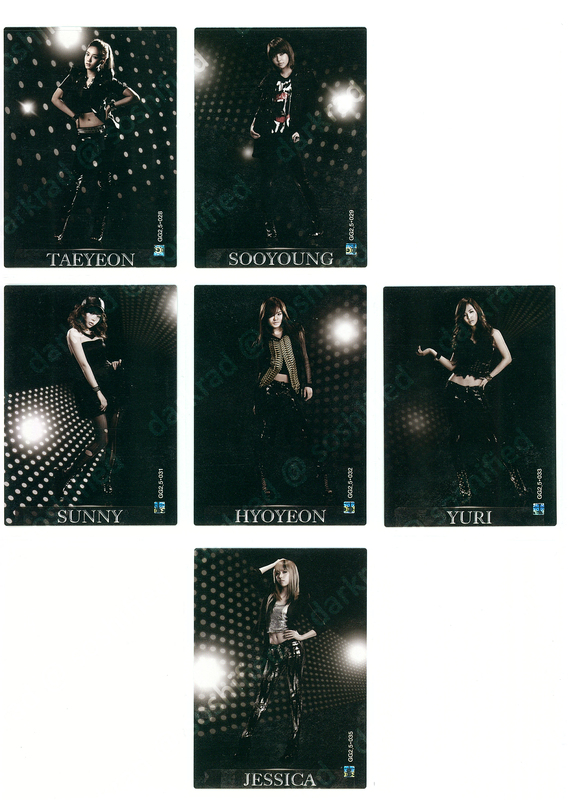 That’s why I was terribly shocked when finding my Hyo card hahaha (Hyo is my all-time favorite, that’s even better !). I’ve bought tons of sets from season 1 & 2 and never got any sign so I really thought I’d never manage to get one, especially seeing that the season 2.5 is out of print and no one is sellng autos on eBay! Also, I do like the fact that Hyo signed on the pic, I don’t really like that blank side on the card even if it’s easier for the girls to sign there. It would have been better if the auto cards didn’t have the blank space but 2 pics like for the previous seasons. I prefer seeing the autograph on a pic, as long as it’s not hiding the girl’s face, it looks better ^^. I have to agree with you that I don't like this season's autograph design and it does look better when the autograph & picture are together on the same side (despite the autograph might be smaller compared to Season 2.5). Good luck in the 3rd round of the Bingo Event! Can I complete Star Card Season 2.5 for just 1 set of it? One set definitely won’t complete it. You’ll get close with the base cards, but if you’re aiming to complete everything but the actual autographed cards, you’ll need about 10-15 sets, and you’ll still have to trade cards to be able to finish it. OK!!!Thanks!!! It really cleared my mind! Once you’ve confirmed your purchase, you will be asked to pay the item. Just follow the indications and you’re done.